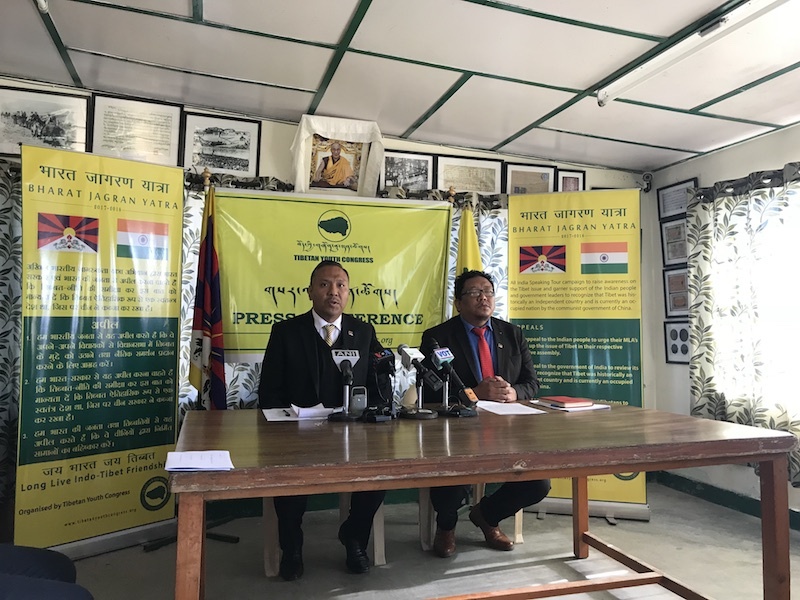 (TibetanReview.net, Nov30, 2017) – Tibetan Youth Congress (TYC), the largest exile Tibetan organization, is to launch a month-long campaign across India on the world human rights day of Dec 10 to garner support for the Tibetan freedom struggle. TYC campaigns for regaining Tibet’s independence, which is at variance with the exile Tibetan administration’s demand for autonomy under Chinese rule. Under the theme of ‘Bharat Jagran Yatra’ (Forum for India Awakening), the campaign will set off from three places: Mcleod Ganj in the north, Salugara in the east and Chennai in the south. Each will be led by a four-member sub-committee, including two Central Executive Committee members each, and cover more than 150 cities and towns across 22 states of the country, said President Tenzing Jigme at a press conference. He said that apart from striving to raise awareness about and support for the Tibet issue, the campaign will focus on three main appeals to the Indian public and government: calling on the people of India to urge their local state legislators, or MLAs, to take up the Tibet issue in their respective legislative assemblies; urging the Indian government to recognize Tibet as a historically Independent country currently under Chinese occupation; and appealing to Indians and Tibetans alike to boycott Chinese products. During the campaign, the TYC will distribute a million pamphlets in six languages – Tibetan, Hindi, English, Nepali, Bengali and Kannada. There will be public rallies, press conferences, talks in colleges, petition signing activities and other advocacy works. The campaign will also cover places where Tibetans are holding their seasonal winter roadside markets to sell winter-wear items. The campaign will culminate in New Delhi and end with the TYC submitting the signed petition to the government of India. TYC campaigns for Tibet’s independence from Chinese rule, which is at variance with the Central Tibetan Administration’s call for autonomy for a united Tibet under Chinese rule.